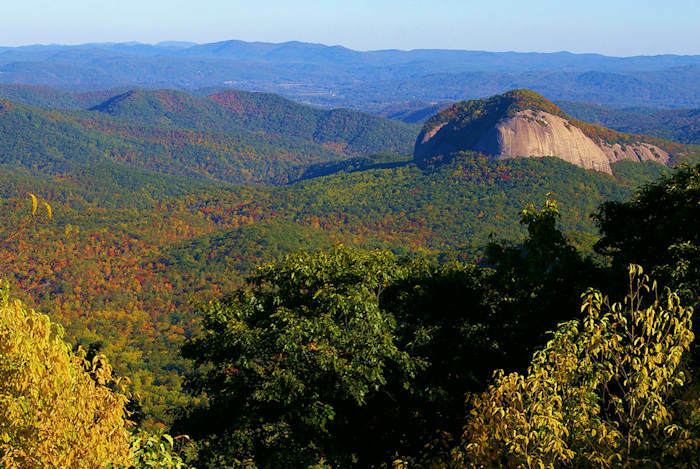 Stone Mountain is the highest point in the DuPont State Recreational Forest at 3,620 feet. Much of the top of this knob is exposed granite slabs that allow for 180 degree views from a great picnic spot and multiple places for partial views, especially in the winter when the leaves are off the trees. 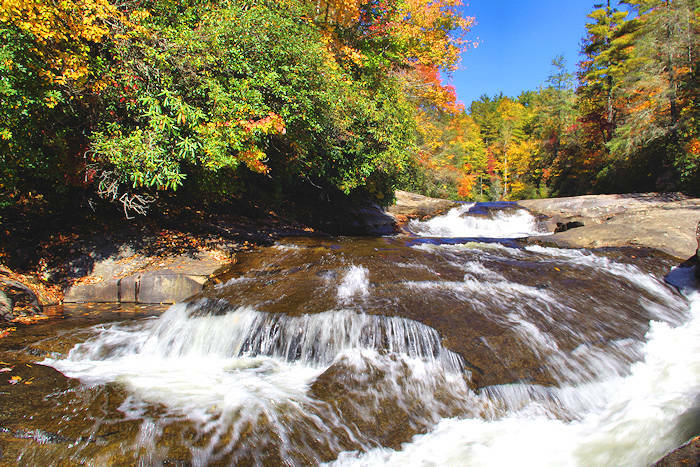 While thousands visit the nearby waterfalls in DuPont Forest (like High Falls, Triple Falls and Bridal Veil Falls), a much smaller number hike to the top of Stone Mountain. This 2.4-mile roundtrip is strenuous, climbing 660 feet in elevation, via the Rocky Ridge Trail. Or take a longer 4.5-mile roundtrip hike with 1,100 feet in elevation gain. Follow the Rocky Ridge Trail from the small parking area along the unpaved Sky Valley Road (1.5 miles past the Guion Farm parking area). At 4/10 mile on the hike, turn right onto Stone Mountain Trail (signed). In another tenth of a mile, turn left to keep on Stone Mountain Trail (Switchback Trail continues straight). This first 1/2 mile of the hike is fairly level. Now get ready to climb to the mountaintop. Pass through a small treeless meadow at the one mile mark. Continue about a quarter mile past this meadow to reach the top. The steepest part of the hike is at the end. 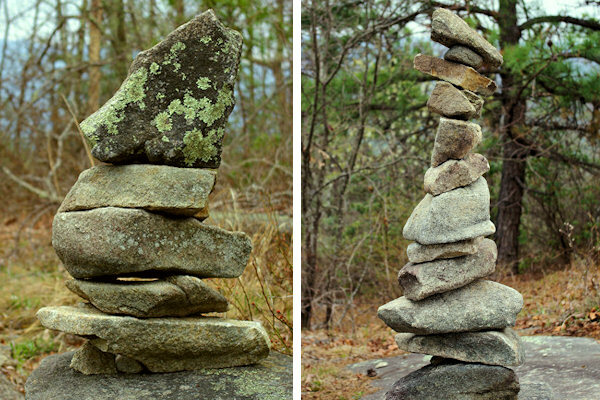 On the summit, find various rock surfaces that afford nice views in multiple directions. 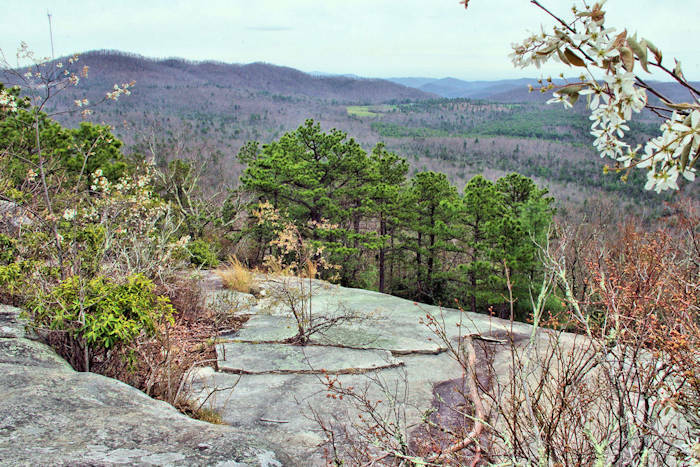 Continue to the left to the largest rock faces that makes a great picnic spot (pic at top), facing south and overlooking DuPont forest. Side trails lead to the other side of the summit for views north toward Mt. Pisgah and Mt. Mitchell. Park your car along the road a mile BEFORE Gunion Farm (so about 2.5 miles before the short hike parking spot). The parking area is about about 50 yards before the pavement ends at the Old CCC Road. Look for the old dirt road ("Rocky Ridge Trail") on the uphill side of the road. Take Rocky Ridge Trail up a steep grade for about 1.5 miles until it intersects with Stone Mountain Trail. Take a left turn at the marked intersection onto Stone Mountain Trail. 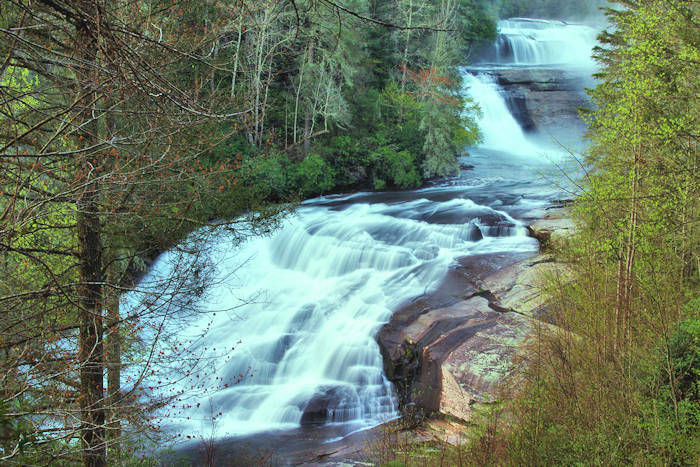 This hike is 3.4 miles roundtrip with an elevation gain of 1,160 feet. Guion Farm Parking From Asheville and I-40: Take I-40 to exit 46A for I 26 East towards Hendersonville. Take I 26 east to Exit 40. Turn right off Exit 40 onto NC 280. Take NC 280 south 16 miles to US 64. Turn left onto US 64 and go 3.7 miles to the stop light. Turn right onto Crab Creek Rd and go 4.3 miles to DuPont Road. Turn right and go .7 miles on DuPont Road to a left on Sky Valley Road. Follow Sky Valley Road past the junction of Old CCC Road (becomes unpaved here) to the Guion Farm Access Area 1.6 miles on the right. For the shorter hike, look for a small parking area to the left at 1.5 miles past Guion Farm. You'll see a sign for Rocky Ridge Trail (old dirt road) with a cable crossing it. So it's easy to find. The longer hike is about a mile BEFORE Guion Farm. Guion Farm parking area is a prime spot for mountain biking, horseback riding and hiking. You'll even find a kids mountain bike trail! Also, park here to hike to Wintergreen Falls. 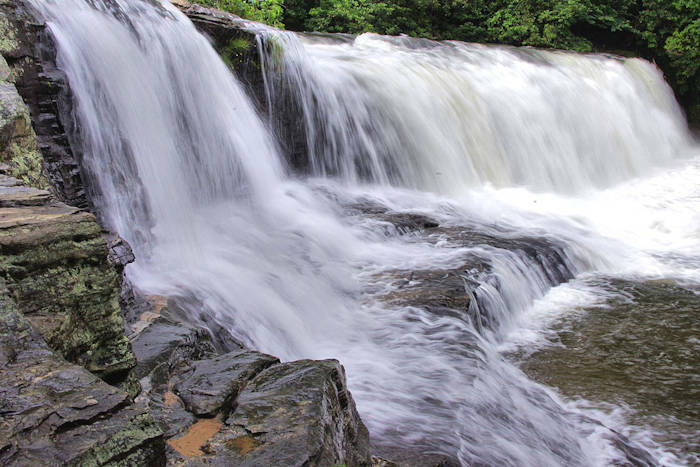 Combine this hike with one to the waterfalls: Triple Falls, Bridal Veil Falls and High Falls (See our DuPont Waterfalls Guide.) Or hike to the top of Cedar Rock with more great views.